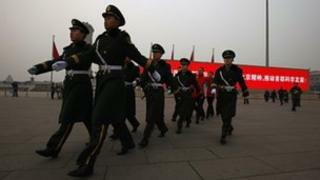 Chinese police have arrested six people and shut 16 websites after rumours were spread that military vehicles were on the streets of Beijing, officials say. The web posts were picked up last week by media outlets around the world, amid uncertainty caused by the ouster of top political leader Bo Xilai. The State Internet Information Office (SIIO) said the rumours had a "very bad influence on the public". Two popular microblogs have temporarily stopped users from posting comments. The two sites, Sina Weibo and Tencent Weibo, are still letting people post to their own sites. But they said commenting on other people's posts would be disabled between 31 March and 3 April, so they "could act to stop the spread of rumours". A spokesman for the SIIO told state news agency Xinhua earlier that the two websites had been "criticised and punished accordingly". There has been no evidence to substantiate the coup allegations but the authorities considered them damaging enough to take this extreme action. Internet forums, microblogging sites, are perhaps the only area in which people could freely express their views, and many have done so anonymously. In a country where there is very little information from the authorities, rumours take on an added value in a way they perhaps would not in other countries. I think this just shows you the Chinese authorities will move to close down any kind of public debate if they can. He added that that a number of other people had been "admonished or educated". China's top leaders are grappling with the biggest political crisis they have faced for years, the BBC's Michael Bristow reports from Beijing. The country will begin a once-in-a-decade leadership change later this year. But one of the main contenders for promotion - Bo Xilai - has just been sacked, suggesting a fierce fight behind the scenes for control of the ruling Communist Party. Mr Bo was removed from his post amid allegations that his police chief and former ally had tried to seek asylum at a US consulate. Chinese censors had previously blocked searches on various sites for terms linked to Mr Bo. There have also been lurid, and unsubstantiated, rumours that Mr Bo's fall was also linked to the death of a British businessman, Neil Heywood, who last year was found dead in a hotel room in Chongqing, the city where Mr Bo was Communist Party chief. The People's Daily, the party's main newspaper, said in a commentary: "Internet rumours and lies packaged as 'facts' will turn conjecture into 'reality,' stir up trouble online and disturb people's minds. "If allowed to run amok, they will seriously disrupt social order, affect social stability and harm social integrity." Our correspondent says that while there is no evidence to substantiate the rumours of a coup, the party is clearly upset.